This page is dedicated to the Fall of the Berlin Wall in 1989. If you would like to know where you can find remaining parts of the Berlin Wall please feel free to have a look at the page Sightseeing > The Berlin Wall. The Fall of the Berlin Wall is probably the most important incident in recent Berlin history – if not in German history, or even in European history. A divided city coming back together – ordinary people, family and friends separated for decades finally coming back to a normal life, overcoming history, making The Wall fall. For years things were not looking good for East Germany’s economy. When Mikhail Gorbachev (former President of the Soviet Union) visited East Berlin in 1989, people were demanding for change publicly. Gorbachev had just made his speech with the famous quote “Dangers await only those who do not react to life“. This was then interpreted and translated into the well known ‘quote’ “Those who are late will be punished by life itself“. People anyways got the message – and nobody wanted to be ‘too late’. On 4 November 1989 over one million people gathered on East Berlin’s central square Alexanderplatz and demanded change. The story goes, that the side streets of Alexanderplatz were packed with military forces. But orders were not followed – and even Russia did not want interfere. The actual Fall of the Berlin Wall basically began on the evening of 9 November 1989 when first at Bornholmer Strasse a few people crossed the border. The East German administration had just made an announcement on TV, that citizens of East Germany could now travel to other countries without any special permission. People couldn’t believe what they just heard – went to the bridge at Bornholmer Strasse and confronted the border patrol with the news. After some back and forth the border patrol let people pass. First there were only very few border crossing points. Later a few holes were cut into the wall to open additional crossing points. 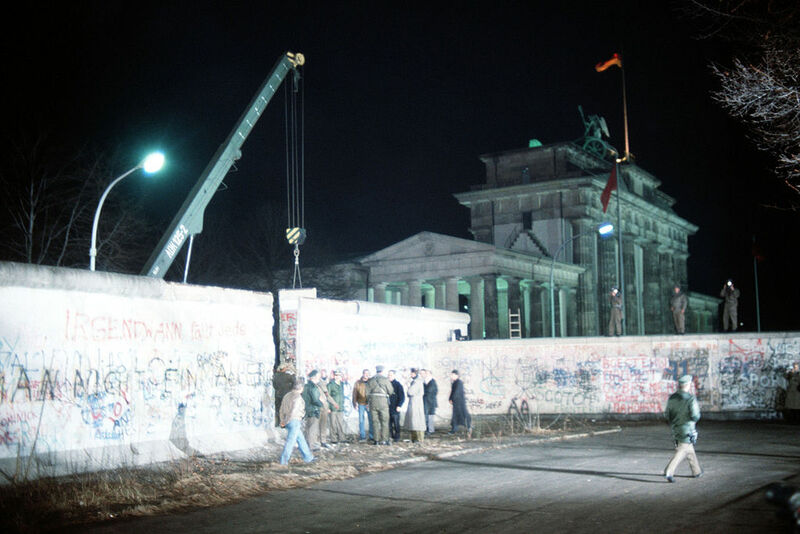 From 1990 on the Berlin Wall was then torn down systematically, piece by piece, meter by meter. Today only few pieces are left ‘on location’ that can actually be visited.